Have you recently developed small white spots or patches on different parts of your body? Are you feeling worried to think that you are suffering from a major skin complication? Well, we are here to clear your doubt and help you out. 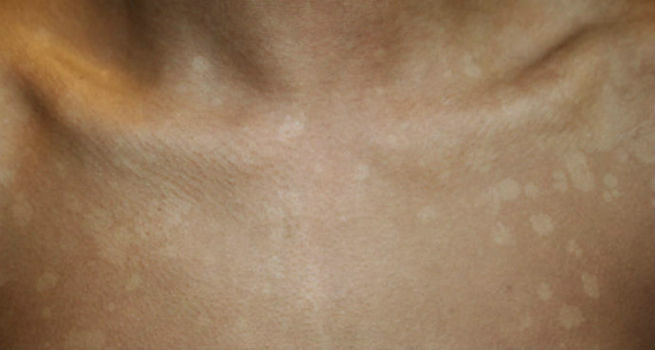 Such white spots often result from a common skin infection caused by tanning. This infection usually blocks the creation of melanin in the affected parts of the skin, which becomes evident when one tries to get tanned. 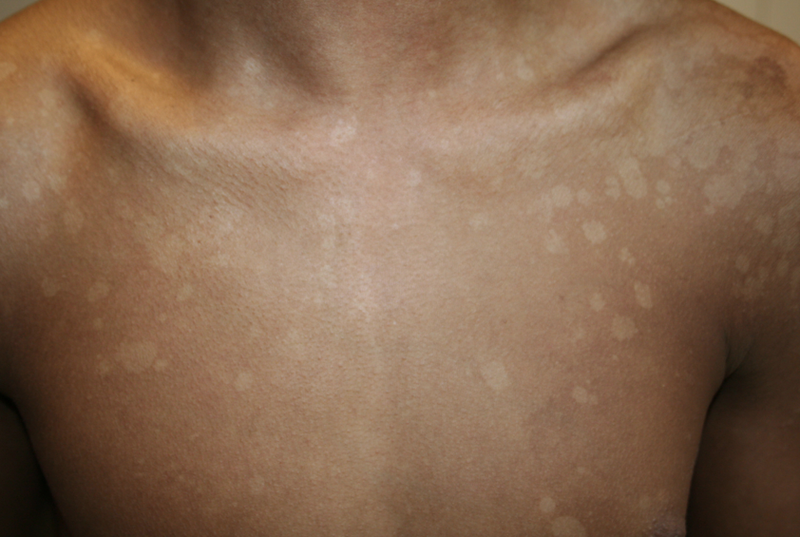 As a result, the infected area remains white in color while the rest of the body gets tanned. Let’s dig deeper into the fact and know how to cure white spots from tanning with simple remedies. The skin infections that cause the white spots change the color and texture of the skin. These changes are more pronounced when the skin around the affected area gets tanned. Here are the various causes of white spots on the body. Tinea Versicolor: Tinea Versicolor is one of the major causes of the white spots on the body. If you live in humid conditions and tend to sweat more, then the chances of contracting the infection are high. Tinea Versicolor is a fungus which interferes with the production of melanin at the spot of the infection. This leads to the formation of white spots. These spots become more visible when the infected area remains as is but the rest of the skin gets tanned on sun exposure. Tanning Beds: If you use tanning beds which subject the skin to artificial UV light to give it a bronzed look, then there are chances of getting affected by this skin condition. White spots from tanning beds occur when blood flow is not even to all parts of the body and some patches do not get tanned as a result. There are also chances of contracting a fungal infection from tanning beds since the humidity and heat on the beds make it a breeding ground for microbes. Once the UV lights are turned off, the fungus kicks into action and can cause an infection which results in white patches on the skin. Anti-Dandruff Shampoo: Wash the affected parts of the skin with a solution made of 1 part of anti-dandruff shampoo and 4 parts of water. Anti-dandruff shampoos have the ability to combat the fungus causing white spots on the skin and thus rid you of the infection. Anti-Fungal Cream: Use of creams that are anti-fungal and contain selenium sulfide (slows down the growth of the fungus) is also another way to treat the infection. Apply the cream persistently to the affected area for a week or two to get visible results. Anti-Fungal Powder: Keep the skin dry as much as possible in order to inhibit the growth of the fungus. Using lots of antifungal powder will not only prevent the production of unwanted moisture in the skin but also fight against the infection. Aloe Vera Gel: Apply fresh aloe vera gel to the troubled areas of your skin generously. Let it dry and repeat 2-3 times daily. This will control the oil on the surface of your skin, thereby controlling the growth of the fungus. Tea Tree Oil: Prepare a mixture combining coconut oil and tea tree oil (3:1) and massage the affected parts of your skin with it gently. This natural anti-fungal remedy will take around 2 weeks to show results. Apple Cider Vinegar (ACV): Apply diluted apple cider vinegar (add 1 teaspoon of the vinegar in a cup of water) to the white spots and wash off with cold water after sometimes. You need to reapply it every 2 hours for at least 2 weeks in one go. Baking Soda: Moisten the white patches on your skin a little and scrub 1 teaspoonful of baking soda on it gently. It will neutralize the pH of your skin, eliminate the infection-causing fungus, and heal the area easily. White Spots on the skin take some time to get healed but they never cause any long-term damage. Until they fade away completely, try to limit sun exposure so that they do not become more pronounced from tanning.